Most items you use to make soup aren’t that expensive…vegetables and cheaper cuts of meat that usually tenderize during this slow cooking process. Thicker soups like split pea or chili contain lots of fiber that fill you up quickly. Soups containing dairy products add a satisfying richness that tricks us into thinking we’ve eaten an elaborate meal. Soup is also a great item to make in large batches and freeze. Never worry about leftover soup. In fact, ask any top chef and he or she will tell you all soups should be eaten the day after they’re made. I’ve been to many restaurants where the menu proudly states all their soups are made the day before. When I make homemade soup sometimes I can’t wait that long but when you do, day old soup has a much more intense flavor. And if you’re thinking about making a stock for the soup, try saving up all your veggie peelings, and boiling them together. Some people also sauté the scraps and add the water after. It does give you a more flavorful stock, but if you’re watching your fat intake, the boiling method works just as well. You can either use the stock straight away or freeze it. You can also make soup from leftover meat bones and don’t forget to add ham bones to soups like navy bean and split pea. Always cook the vegetables in the right order, sauté the onions first, then the root vegetables, then the ones that tend to cook quickly like zucchini. To lower the fat content-If you find you have to add more oil to sauté the veggies, try adding some water or even stock. To get a creamy soup without adding cream, take out some of the soup, put it in a blender and then add it back to the pot. If a recipe calls for cream or half and half, I use about only 25% of the amount the recipe calls for and then I top it up with low fat milk. 1. Melt butter, add onions, potatoes and cook slowly for about five minutes. 2. Add bay leaf, stock cubes, water and cover and cook for 30 minutes. 3. Blend the entire mixture, return to the heat and gently reheat. 4. Serve with a sprinkling of chives and shredded cheese. This soup relies on fire-roasted tomatoes and smoky chipotle seasoning to maximize its flavor without adding too much fat. It also gets a creamy texture from pureeing the finished product. And uses the higher in fat ingredients like avocado and sour cream as a garnish rather than a main ingredient. 2 teaspoons of Chipotle hot sauce. 1. Heat oil over medium heat in a large saucepan. 2. Add the onions and cook until soft and translucent, about 5-8 minutes. Add the chipotle seasoning and hot sauce and make sure all the onions are well coated. Cook for one minute. 3.Slowly add the vegetable stock, bring to a boil, and simmer until onions are completely cooked, about five minutes. 4. Add both cans of fire roasted chopped tomatoes and heat through. Taking about 2 cups of the soup at a time, puree everything in a blender. When the whole mixture is pureed return to the pan and heat through. 5. Stir in the corn. Adjust taste and if you like foods really hot you can add more hot sauce. For the avocado cream, peel and mash the avocado add a dash of lime juice to stop the avocado from discoloring and then add the sour cream and blend together. Ladle the soup into a bowl and place about a tablespoon of the avocado cream in the center. The longer this soup sits the better, it freezes perfectly, and a great accompaniment is blue corn tortilla chips. Place lentils, onions and carrots in a saucepan, top with water, tomatoes and spices. Place everything in a blender and blend. Return mixture to the pan and add about another cup of water and simmer 10 minutes. My late father taught me lots of things about watching your money. One was checking every bill you receive. These days we’re all busy and it’s easy just to write a check and put it in the mail. However, that can cost you money. Just this week we had two bills that had errors on them. First one was from the dentist. We’d paid the bill two weeks ago and got sent a second notice just ten days later. Second one was the cable company who charged us for a call out visit when a technican needed to stop by to update some outside wiring because of some upgrades the company had done. If we’d paid these two bills without checking the amount would have been close to $700. It might not happen on every bill and probably not for that much money but it’s budget smart to look over every item before you write that check. I hadn’t realized that January is National Soup Month but with the cold weather everyone’s experiencing what could be better than a bowl of homemade soup. I’m a big fan of soup, not only because it tastes good but it’s great for your budget too. So this week that’s my focus. Soups that are easy to make and also how you can give canned soups some gourmet pizzazz. This one was created just the other week when I discovered I had no breadrumbs and didn’t have time to head to the store. 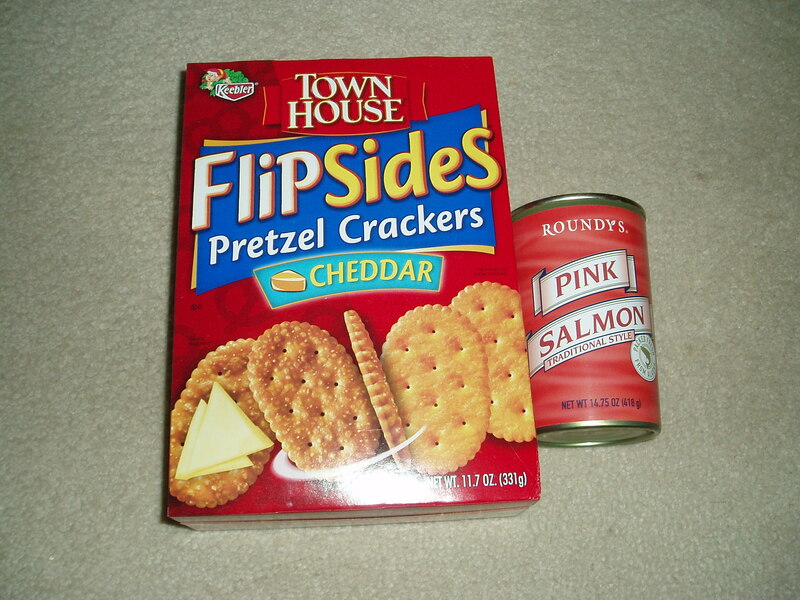 I’d stockpiled some boxes of crackers (Townhouse Flipsides) during the holidays while they were on sale. I used about 15-20 of them. I crushed them in a plastic bag using a rolling pin. And then added them to the drained salmon, and a beaten egg. You mix it together and form into four patties. Heat some oil and cook them on either side for about 3 minutes or until golden brown. I served mine in a bun with oven fries. I think just the burger and a side salad with be good too. This is a three ingredient recipe that is so simple to make and the best thing is the crackers have so much flavor you don’t need seasoning or salt and pepper. I bought all these goodies while they were on sale for just 99 cents a bag. 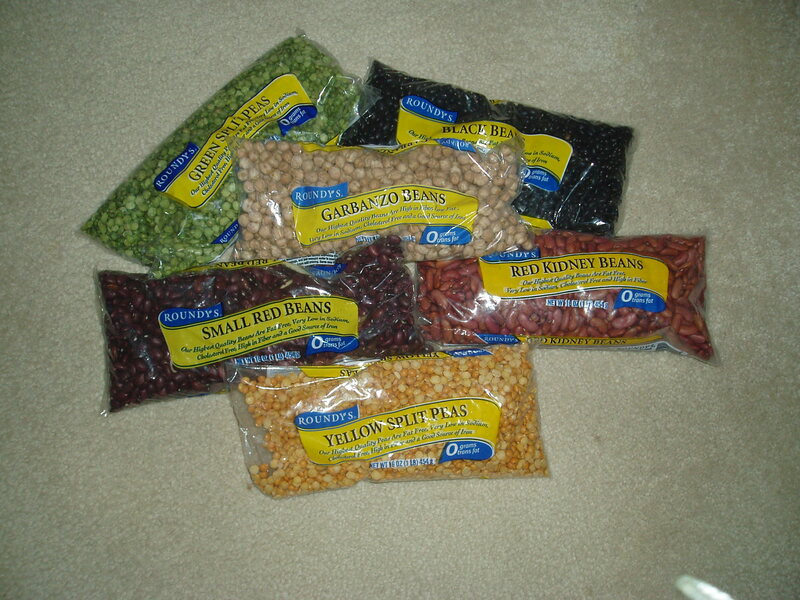 I do buy canned beans but you can save even more money using dried ones. You can make bean and veggie burgers, lentil soups and stews, green pea soup etc. Best thing is most of these recipes can be made in a slow cooker. I’ll be featuring recipes using all these items in future articles on the site. I know eggs took a bad rap because of their high fat and cholesterol content but even nutritionists now say eaten in moderation, they’re okay. I stock up on them each time I visit the store. They’re great for egg and cheese burritos, frittatas, your own homemade egg muffins for breakfast, quiches, and omelets. Keeping a some hard boiled eggs on hand also make great snacks too. Produce has gotten more expensive recently but I think it’s still a good buy because it full of fiber so it fills you up and if you use more veggies than say meat or chicken in a dish the recipe goes further. Eat in season and it’s a great way to save even more money. For example, this week my local supermarket had a sale on citrus fruits so I bought oranges and have been using them as snacks and dessert. I know some people turn their nose up at it but it’s a good for you food at rock bottom prices. I’m working on a great oven baked oatmeal recipe that once perfected I’ll be sharing it with you. No more cooking oatmeal every day and this one is packed full of flavor with oranges and sweetened cranberries. Another way you can use oatmeal is in things like meatloaves to make it go further. Freeze the tofu for a few days and then defrost it. Drain the tofu and squeeze out all the water, crumble into pieces that resemble ground beef. Place it in a glass dish and add some oil, soy sauce, pepper, Worchestershire sauce and chopped garlic. Let this sit for at least six hours. Then heat a skillet, add some oil and saute the tofu until it’s crisp and brown. Add the onions and carrots and cook until almost tender. Add the mushroom gravy and stir everything together. Transfer into a baking dish and top with mashed potatoes. I like to sprinkle them with smoked paprika and cheese. Place in the oven for about 15 minutes at 375 degrees or until the top is lightly browned and the tofu mixture is bubbling. I usually serve this with peas or green beans. We all do it…buy food, forget to eat it and the garbage bin becomes the recipient of our wasted dollars. Vegetables always seem to be my Achilles’ Heel. Sometimes I’m cleaning out the produce bin and find an item that I can no longer identitfy. So one of my New Year’s resolutions is to make sure that doesn’t happen…or at least less often in 2011. Whatever your Achilles’ Heel, here are some things I’ve found helps keep me on track. I know this take extra time and most of us don’t have a lot of it right now. However, when you’re putting together your shopping list think about items you can use for more than one meal. For example, a whole chicken can be dinner one night and leftovers can be turned into chili or burritos. Canned foods like tomato sauce or evaporated milk are great to use in soups and stews. I’ve set aside one day a week (Sunday in my house) as Leftovers Day. I take out everything we haven’t eaten the rest of the week and set it on the counter as a buffet style meal. Sometimes it’s veggies left from one meal, potatoes from another. It also gets the fridge cleaned out for the following week and nothing goes to waste. If I don’t use leftovers like gravies and sauces I freeze them. Same goes for waffles, bread rolls and muffins. Another one of my resolutions is to make more homemade stock. I have a container in the freezer to which I add veggie peelings. Once I’ve made the stock I plan on freezing that too. One of my favorite restaurants always features a vegetable and bean soup every day. It took me awhile to figure out why and it wasn’t because it was a customer favorite. The restaurant is using leftover veggies and beans and putting them to good use…soup they can sell every day. I now do the same thing. If I have leftover vegetables, pasta, beans etc. I make soup with it. It’s great because you never have the same combination so it’s always new. Some of my favorite soups have been created this way. I don’t know why but in the winter I always seem to have half a lemon sitting in my fridge. I could never find a use for it other than slicing it up and using it in water. Now I use lemon juice which you find in those plastic lemons in the produce department. I know it’s not pure lemon juice…it has some preservatives but it’s easy to store, I always have some on hand and nothing goes to waste. 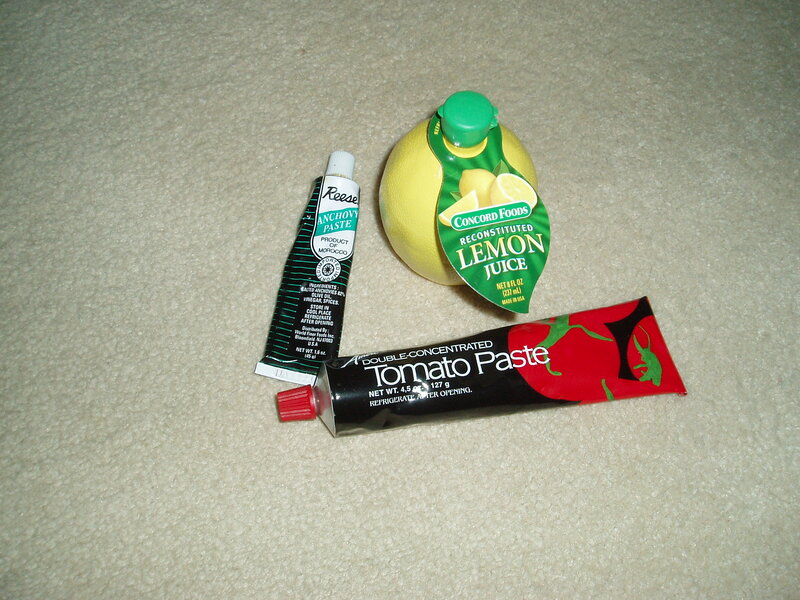 The same goes for tomato paste. I’d use half a can and the rest would sit in the fridge unsued. Now I buy it in tubes. Same goes for anchovy paste. I don’t use anchovies that often so it’s the perfect solution. And my final way of using everything. If you have a couple of tablespoons of salsa, use it on scambled eggs. Dressing I use as a sandwish spread. Things like pickles get chopped up and put into homemade Thousand Island dressing. Sometimes coupons show up out of the blue. While I was shopping last week I walked by the freezer section that houses the vegetarian food and saw this booklet on a display. 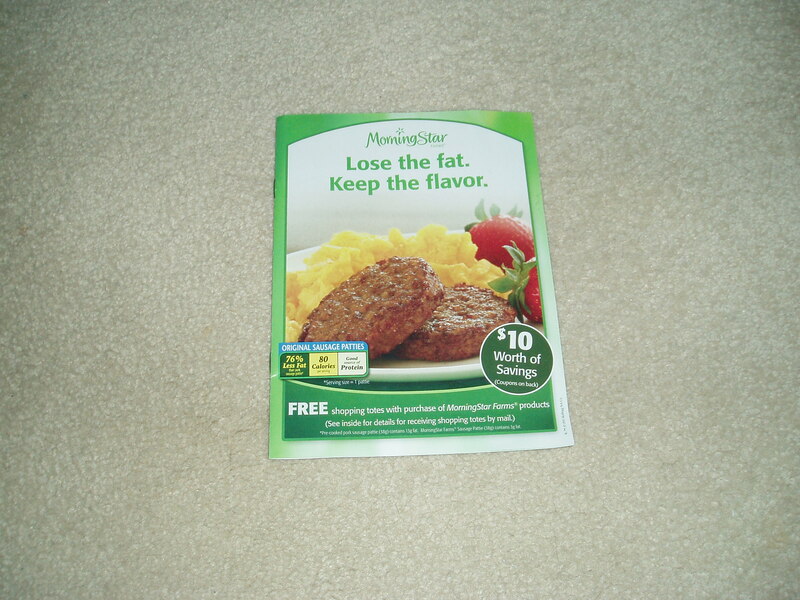 It’s for Morningstar Foods and lucky for me I always buy a few packages of their veggie burgers to keep in the freezer. 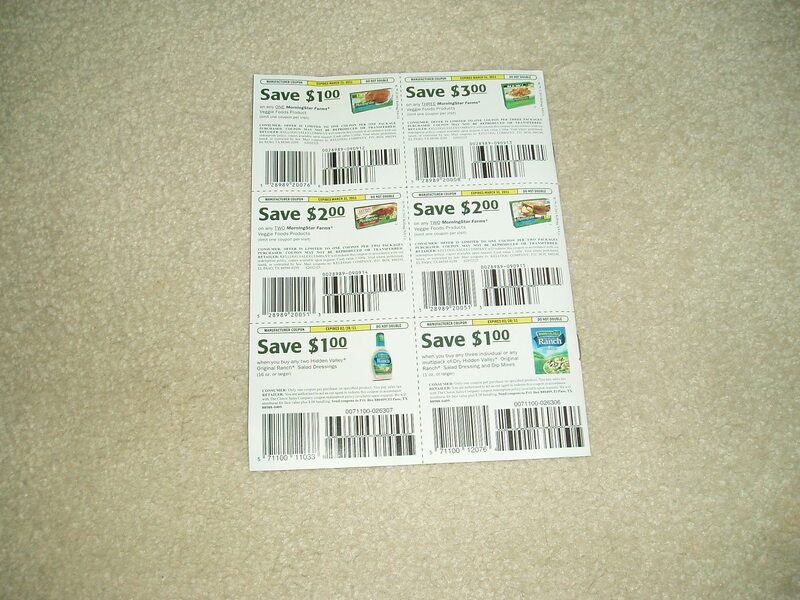 The coupons aren’t just 50 cents or less but one’s for $3. Okay, you have to buy more than one item but like I said these products are great for the freezer. They’re on my top five list of things to ‘make’ for dinner when I’m out of time. The booklet also has a form you can fill in and send in along with three upcs for a free tote bag. So altogether not a bad find while strolling by the frozen foods. Speaking of food, did you hear prices are expected to go up this year? With that in mind I thought I’d focus on food topics this week on the site. Ways to waste less food…yes, we all do it. And bargain foods that are good for you. 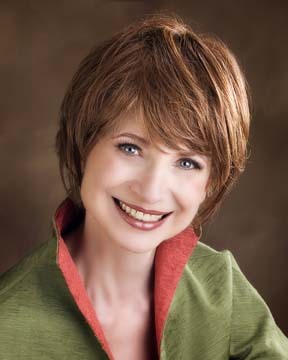 This site www.onlineorganizing.com is a great place to start. It has lots of links, articles, templates, etc. So take an hour or so doing some browsing and making notes. Someone told me about this site a few years ago http://www.cozi.com/ It’s free to register and use and you can create a shopping list and coordinate everyone’s schedule. The big organizing containers are inexpensive and always seem to be on sale but it’s the smaller and sometimes more useful ones that seem to cost an arm and a leg. So I’ve found some other items that work just as well. About five years ago when our refrigerator bit the dust, before it was hauled away I realized some of the fixtures like the produce bins would make perfect and yes, free organizers. The dairy container now sits in the pantry and is home to things like gravy mixes. And the produce bins now house hats, mittens and scarves in the closet by the front door. And the wire racks that once sat in the freezer section are perfect for keeping all my pots and seed trays organized in the potting shed. One of my goals last year was to keep my shoes more organized in the closet. I thought about buying some of the plastic shoe boxes, but then came up with another idea. I’d bought several boxes of Simple Harvest cereal while it was on special. The cereal comes in a study box with a see through window on one side. And if, like me, you have small feet, these boxes make perfect storage ‘bins’ for off season shoes like flip flops. I’ve also used oatmeal canisters for craft supplies like knitting needles. And for my birthday last year someone gave me some flowers that were arranged in a square glass vase. It now sits on my office desk and houses all my pens and pencils. And in the kitchen attractive soda bottles make ideal containers for things like lentils and split peas. As you know I like to shop the bulk bins. The only drawback is you have to find containers for all these great buys. One solution, those square mayonnaise containers, perfect for things like rice, oatmeal etc. Plus, they’re all the same size which keeps the pantry looking neat and tidy. So my advice here, plenty of items… and ones you might just throw away, can be turned into organizing bins…if you use a little imagination. Oh, and don’t forget labels on packages. If you don’t have a label making machine, you can cut out words like flour, sugar from packages and bags and stick them on containers. I have to admit I’m always looking for ways to use something twice so it doesn’t end up in the landfill. 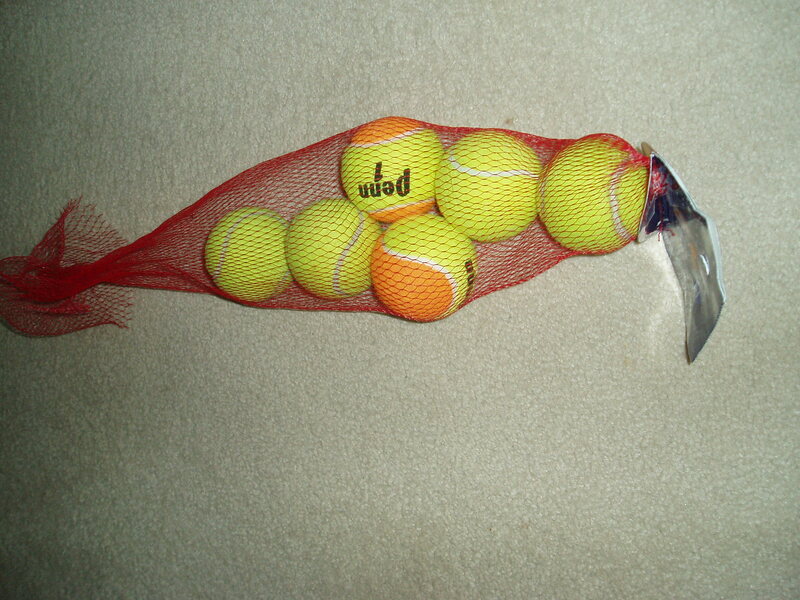 Here’s an idea I got at Christmas when I bought oranges and had two or three of these string bags left over. Perfect for storing tennis, golf balls, dog toys, even bath toys for the kids. For me the closets are some of the hardest areas of the house to get and keep organized. A couple of tips I have are-one, if you can, use all the same type and size hangers. I got rid of all the wire hangers and replaced them with plastic ones. I’ve even color-coded them with certain pieces of clothing. White for blouses, blue for jackets, etc. The closet, without doing that much to it, looks more organized, and the more organized it looks the more incentive I have to keep it that way. And here’s another trick I found. I often couldn’t remember what needed mending, cleaning etc. That was until I found a bunch of twist ties from the garbage bags. I never use them and they always seem to get thrown into one of the kitchen drawers. Now when something needs attention I tie one of the twist ties around the hanger. It’s also works if you have a piece of clothing you’re not sure about keeping or donating to charity. 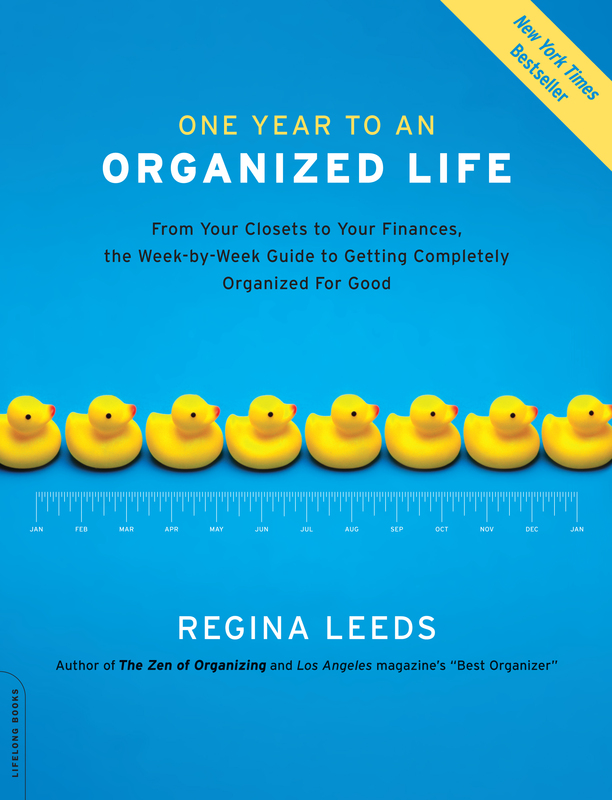 Budget Smart Girl (BSG)-What mistakes do most of us make (especially when we’re on a budget), when we start organizing? Regina Leeds (RL)-People are busy, stressed and will make a snap decision to ‘get organized’ over the course of a few hours one weekend afternoon. The problem with that is there is no plan of attack. And since it took time to tumble into chaos, it stands to reason it will take time to create order and the systems that will keep it all in place. A new and rather modern mistake is going shopping for containers before you know what you need. I see closets and spare rooms filled with containers that look pretty but aren’t needed. Containers can be the new clutter in the home rather than the long needed solution. A big mistake couples make is for one person to make decisions about the possessions of the other without asking. This is a violation of privacy and can only lead to an argument or long festering negative feelings! I believe children and especially teens should also be a part of the process rather than come home and find their rooms have been raided in the name of organizing. That’s a great way to inadvertently create a slob! Rebellion takes many forms. It pays to remember the first rule of Zen Organizing: the whole of anything is overwhelming; therefore you need to break a project down into the parts that will bring you to completion. It’s one thing to say: I have to make decisions about the items on the counters in the kitchen. It’s another to stand there and think: Today I need to organize the entire kitchen. The former presents you with an achievable goal; while the latter overwhelms you with its scope. BSG-My toughest task is organizing the pantry. I keep it well stocked, use items constantly, get too busy to put things back where they came from and within a week it’s back to chaos. Any tips for keeping it in tip top shape? 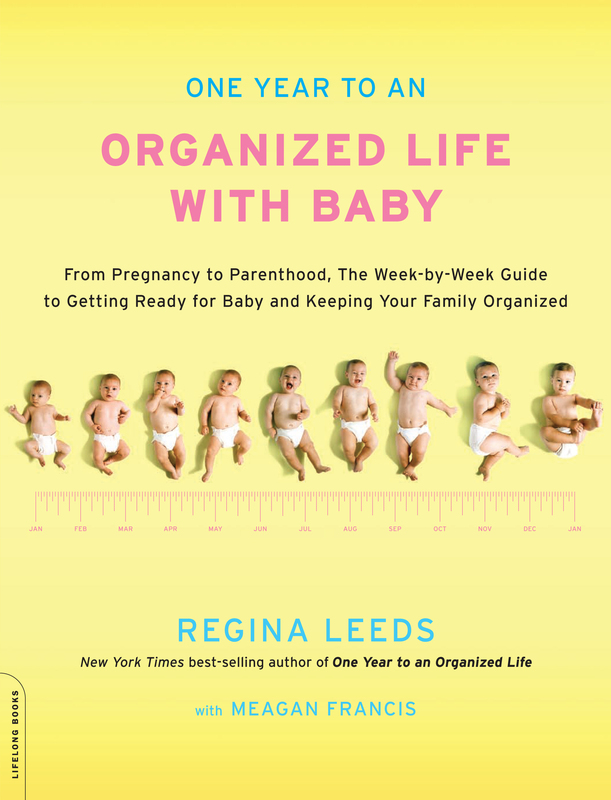 RL-My hunch is that you are ‘tidying up’ rather than ‘getting organized.’ To organize means you assign a specific spot for an item. It takes as much time to toss my keys into the void as it does to place them in a dish or designated hook. People assume maintenance is some special drain on your time. It’s merely a re-direction of energy! 2. Use shelf dividers (designed for the clothes closet) to keep categories separate. You don’t want the bags of pasta to bleed over into the soup can area, do you? 3. Some items can also be kept in baskets and that will keep them corralled. Think potatoes, onions and the like. Very often we receive gift baskets and they are ideal for this task. It’s the ultimate in recycling. Here’s an all too familiar scenario…you look through your closet and either you conclude you’ve got nothing to wear or you wonder why you bought that dress in the first place. If only you could find a place to buy different stuff or sell the items you already own. Check out www.smashion.com I’ve listed some clothing and shoes there and so far have sold one item. Best news is there are no listing fees or commission taken out of your sales. I usually make a time consuming dessert to finish the Christmas meal but this year, I’d been just too busy all December and feeling lazy. There’s nothing easier than putting together things you have sitting in the pantry and freezer. Christmas morning I remembered two of those things. 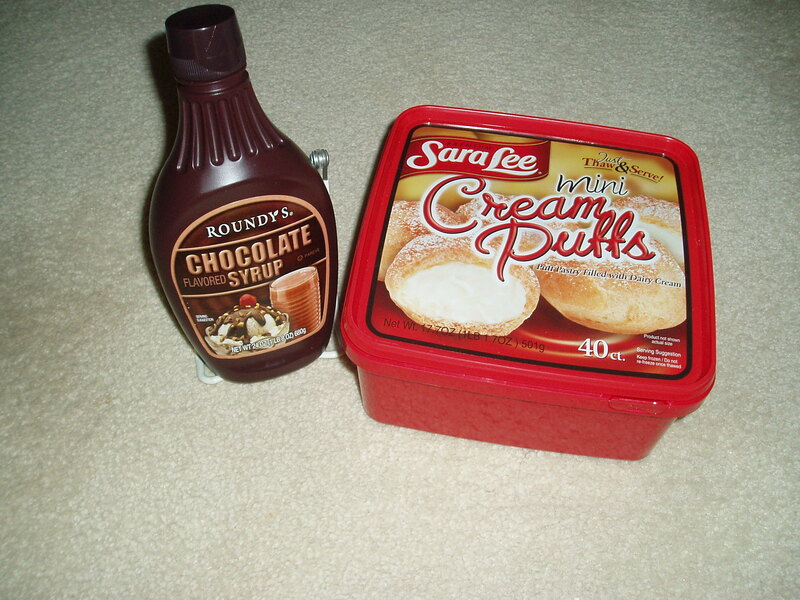 Sara Lee creamed filled puffs and chocolate syrup. Just put about seven or eight of them in a bowl and lightly dizzle the syrup on the top. Looks like a gourmet cook put it together. And as the cream puffs were one of my double coupon day bargains, the whole thing cost me less than $4. I’m thinking this is also a good dessert for Valentine’s Day too. Divide chores into smaller tasks and don’t try and do everything in one day. Vacuum one day, dust another etc. Let products sit and do their work while you do something else. For example, I use baking soda and vinegar to clean drains in the sinks and the toilet bowls. I let the mixture sit for an hour while I do laundry etc. Don’t use too much product. Most people use too much glass cleaner and it takes more work and elbow grease to remove it. Use microfiber products. Most of them work perfectly without cleaners so you cut down on the number of products you carry around and they do a top notch job with minimum effort. And you save money too. Remember not everything needs cleaning every time. Pick and choose what looks dirty. Clean when the sun is shining in your house. You’ll see things like cobwebs and dust you missed on over-cast days. I always feel the produce department looks boring (and inexpensive) this time of the year but yesterday I bought some avocadoes and oranges, both of which were really good and budget friendly. Oranges are great for snacking and avocadoes combined with tomatoes and even roasted red peppers make wonderful sandwiches. When the last of the Christmas decorations are taken down and stored away for another year, things can seem bland and boring. I know lots of people spend their winter weekends dining out and shopping but here are some of my ideas for keeping yourself busy without spending a fortune. The price of going to the movies and buying a drink and popcorn isn’t as cheap as it was even two years ago, but who says you have to bundle up and head out into the cold to see a movie? If you have cable TV you can opt for the movies on demand option. Or if you’re one of the many people who have said goodbye to cable TV, check out your local library. You’d be suprised at all the recent releases they have there. Another option is the Redbox rentals. I have two close to where I live but have yet to try them. Rentals are just $1 www.redbox.com Signup for their newsletter and it looks like you get a coupon for a free rental on Mondays. And if you find a great pizza coupon at the above mentioned site you can throw a movie and pizza night. Some people like to do most of their reading during the lazy days of summer, but who doesn’t love to curl up with a warm blanket and a good book? This is the idea time of the year to get to know your local library and try reading a book in a genre you’ve never tried before, or even reading a couple of non-fiction titles. I saw this on a how to save money in 2011 article just the other day, learn a new skill and winter’s the perfect time to do it. Okay, you might not want to go back to school, but lots of community education programs offer a wide selection of courses from now until the end of the school year. Maybe learn something you can put to good use in the summer. Or even learn a new language for the day you travel to a foreign land and sitting on that beach is no longer a dream but reality! As you all know my new hobby is flower arranging. Why not try your hand at something new and try selling it on Etsy or even look into craft fairs that will be held in your area this summer. It’s the perfect way to make some extra cash. How many of us have little chores and DIY jobs to do around our house but never seem to find the time to complete? There are lots on my list and if you get them down now, you’ll have more time for leisure time when the warm weather rolls around. If you really do feel you need to head out, many local attractions remain open, but have lower attendance during the winter. Why not check if any of your local museums, or even zoos offer reduced admission fees.